Confined to southern half of Ireland. Adults fly during June and July. This and the Banded Demoiselle are the largest Irish damselfly species. 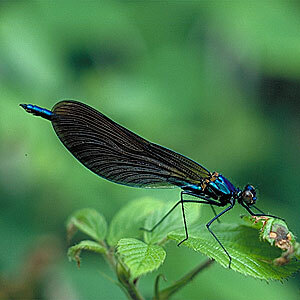 The Beautiful Demoiselle is found on rivers of moderate flow with stony and gravelly beds. It can be found along wooded streams. Suitable habitat exists in northern half of Ireland but there are no confirmed records. This species is very similar to the Banded Demoiselle Calopteryx splendens. The males of the two species can easily be distinguished as in C. splendens the wing pigment is confined to a broad central band whereas in C. virgo it covers the entire wing. The females are more difficult to separate but in C. virgo the wings are broader and have a brownish tint whilst in C. splendens the wings are tinted green.